Here is the Ortlieb Micro Saddle Bag Review from Enjoy Cycling. After purchasing a Specialized Mini Wedgie Bag for my bike just over 12 months ago I now wish I hadn’t a really awkward bag that is hard to open and after only 12 months the zip has broken and it’s reached the end of its life. Again this is another reason not to buy another specialized product. After owning an Ortlieb Velocity waterproof rucksack and being extremely pleased with my purchase I have decided to buy a Ortlieb Micro Saddle Bag to replace the sub standard specialized product.So far so good and her is my review of this great product. German manufacturer Ortlieb have made a habit of making quality products and the Ortlieb Micro Saddle Bag is no exception. The bag comes in a range of funky colours including blue, orange, black and green. Its small and ultra light yet ideal for fitting in the essentials needed for a few hours in the saddle. The bag sits perfectly under your bike seat and is secured by a small bracket and two screws. It is secure and will not fall off yet its easy to remove with one hand. The exterior comes with a handy reflective strip for high visibility and two bungee straps that close the bag securely. 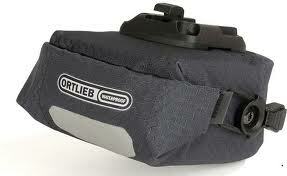 Like all Ortlieb products the Micro Saddle Bag is waterproof which protects the contents from the elements. One of the main problems with saddlebags is that the ip can become dirty and hard to open and this is where the Ortlieb stands out. Like its bigger relations such as the velocity rucksack the saddlebag is opened and closed using the watertight folding closure. This removes the need for awkward zips and is a great selling point for the Ortlieb. Even though it’s small in is size there is enough room in the Ortlieb Micro Saddle Bag to store the essential such as a tube, tyre leavers, cash, CO2 and even a mobile phone. I have to say that so far I am pleased with my purchase I would recommend it to any cyclist. It also comes with a 5 year guarantee so it gives you peace of mind.